Listening to Democrats after winning two states they already controlled you would think they had taken over the nation, including Congress and the White House, and that all the people have risen up against Trump to anoint Hillary or some other Democrat loon as president. This kind of delusional thinking is what led to their defeat in 2016. Having lost the vast majority of elections for the last eight years they not only glom on to any small victory in desperate hope, but elevate it to epic proportions. Really? What changed? This is like one of their congressional picks thinking he would win an election “for the Ages” just before he went down in flames. Democrats barely held on to their governor’s seat in Virginia. They almost lost it, but Gillespie refused to embrace President Trump’s agenda. Democrats didn’t defeat Trump because he wasn’t on the ballot. Had Gillespie endorsed Trump and won then that would have been the upset. But there are still too many Republicans dedicated to keeping the Washington Swamp intact and working with Democrats. Liberals think winning governorships in blue states against Republicans who reject Trump means all Trump Republicans have been utterly defeated and the nation has turned against Trump and his agenda. Just wait till 2018 when Republicans repeat 2002 and pick up seats in the House and Senate. Then watch the Left do a rerun of Nov 8, 2016 and go apoplectic, then curl into the fetal position sucking their thumbs while crying for their mommies. Their hopes lie in Republicans who are betraying Trump and all Republicans voters like McCain, Flake, Corker, and many others who are working with leftist Democrats against Trump. These people don’t want to work for Republican voters because they are infiltrators who have been lying to voters for decades. Remember why Jeb Bush lost – because he wanted to win the primaries without the Republican base. He wanted to appeal to liberal Democrats and have nothing to do with patriots of the TEA Party. Well that’s what Trump did! He won by standing for a solid conservative agenda and he not only won the TEA Party vote but also pulled back millions of Democrats who still love America. Bush & Co. appealing to the America haters vote got nothing and went nowhere because those people are all dedicated to the leftwing Democrat socialists. In the last year no Republican has won who has rejected Trump and his rightwing agenda, and such people will not win in 2018 and it’s got Washington elites quaking in fear. This error in judgement is partly caused by the delusional propaganda of the leftist media saying Trump is unpopular and a losing proposition. In 2016 Democrats believed their media propagandists that Hillary would win the presidency in an easy landslide. They didn’t believe their own eyes when they saw the rallies in which Trump drew tens of thousands while Hillary couldn’t draw flies. Trump won thirty states including six that had previously voted for Obama. 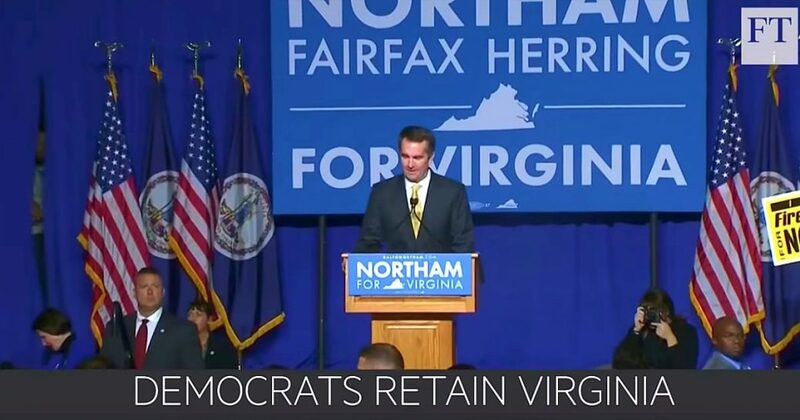 Virginia was the only hold out of previously red states only because the governor had pardoned 200,000 felons to give criminal Democrats the vote and, like California, allowed illegal aliens to vote. They proved that Democrats will resort to any means by which to cheat the good people of America. These states, who stuff the ballot box with the votes of those who take away the rights of American citizens, are the primary reason why federal guidelines to prevent voter fraud are desperately needed. This is not to say the government should emulate Obama who tried to have his Homeland goons take control of voting in red states to alter their votes, but thankfully failed. It does, however, call for initiating a mandate that all people who register must use thumb print as well as picture ID. This would prevent most of the Democrat voter fraud having dead people, illegals, multi-state voters, and frauds pretending to be someone who doesn’t ever vote because they suffer from voter apathy, cast ballots. Liberals lie to themselves about what every election means just as they did about Hillary winning the White House. The Republican governor candidates who lost did so for one simple reason – they joined with Democrats to reject Trump and the rightwing agenda he upholds. If they would rather work in opposition to Republican voters and work with Democrats as does much of the GOP then they should change sides and shouldn’t be surprised they lost to someone who hates Trump more than they. Playing the underdog waiting to be fed favors by powerful Democrats is not why Americans vote Republican. 2018 should see an increase in Republican control of Congress, but it will be at the expense of the Republican establishment who get primaried by candidates who would stand with Trump against the Swamp. Since Obama’s victory the Democrats have lost 12 governorships, 62 House seats, 9 Senate seats, and 958 state legislature seats. They lost every special election in attempts to take seats from Republicans chosen for Trump’s Cabinet. This is the first election in a year that they’ve won and they act like it means they have impeached Trump. It’s a sickness of the mind.